Community Supported Agriculture - "CSA"
CSA stands for “Community Supported Agriculture”. CSA members purchase a subscription to the farm’s harvest prior to the growing season. In exchange for the membership fee, CSA members will receive a portion of the farm's harvest throughout the growing season. CSA programs are a wonderful way for people to strengthen their relationship with food through an increased awareness of the cycles of nature and the gift of harvest. At times, it can also demonstrate the inherent risks of growing food, and the resulting effects. For example, during a cool & wet growing year heat-loving crops such as tomatoes and peppers will suffer (with diminished yield), while other crops such as lettuce and peas thrive under the same conditions. By being a member of a CSA you will be sharing in both the potential risks and bounty of farming. You will also enjoy fresh, ripe, seasonal produce grown right here in Northwestern Ontario! 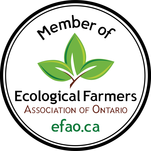 There are a number of other benefits to the CSA member which include supporting your local economy, minimizing the carbon footprint related to feeding your family, becoming connected with farming, and trust in the quality and safety of the food you eat. We, the farmers are directly accountable to you, our members. Benefits to the farmers include a guaranteed sale of much of the farm’s produce, money at the beginning of the season when it is needed most, and pride in contributing to our community in a real and meaningful way. Additionally, we get the opportunity to get to know our Members on a personal level which is often very rewarding as many of our customers are passionate about the same things as us. CSA is not only about high quality food – it’s also about community building. "I wanted to write a short note to you to say how much we enjoyed the food that you produced and how we appreciated your dedication and hard work. Any farm, but especially an organic farm, obviously takes a lot of knowledge and constant work. We feel very fortunate to have you in our neighbourhood and to be able to eat your fresh, organic food. Our diet has changed considerably and is much more plant based. We enjoyed learning how to cook new dishes and to taste foods such as Hubbard squash for the first time. So in a nutshell -great job and thanks! We look forward to seeing you this coming summer." WE HOPE YOU CHOOSE TO JOIN THE SLEEPY G COMMUNITY! Subscriptions are sold for the entire season on a first-come, first-served basis. A deposit is required to secure your space. The balance is due at the first delivery date. Savour Share - Support the work we do and enjoy the fruits (vegetables) of our labour! Our distribution method is simple, each week we harvest everything in the field that is ready and perfect to eat. We set up exclusive Farmer's Markets at Wilson Street Park and at the Farm. You arrive and select the prescribed number of items of whatever vegetables you want (with occasional limitations on some in-demand items). ​It is our intention that your CSA box will fulfill most, if not all of your family’s weekly vegetable needs. Feedback from our customers suggests that a CSA box is about the right amount of vegetables for a family of 4 and often encourages families to cook and eat more veggies! An example of one week's offerings!